Tonight I went to Salem…New Hampshire. It’s about 30 miles from Salem, Massachusetts, and about 16 miles from where I live. 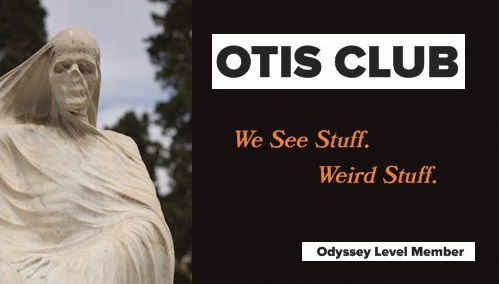 I’ve always wanted to do an OTIS Halloween Blog post where I “confuse” the two cities and spend a day in the New Hampshire version looking for spooky stuff. I was there to help a friend out. He was in charge of creating a haunted hallway for the harvest party at his kid’s elementary school. I mentioned this friend in the October 4 entry from last year’s Halloween Die-ary. He's the guy who can make some pretty amazing stuff using pretty basic household materials. He’s been creating the haunted hallway for a few years at that school, and every year he gets asked by somebody, “Is this going to be too scary for the kids?” His answer out loud is always “No,” but I’m pretty sure his interior monologue is going, “Yes, but that’s a good thing.” Because that’s what my “inside voices” would be saying. Although, apparently, kids did cry at last year’s haunted hallway. So there’s that. Now, I’m not good with my hands. They were made for peckin’ keys. I’m helpless at doing anything that involves making physical materials conform to my or anybody else’s will. But I told him I’d help out as best as I could. Because I’m a good guy…who needs content for this blog. And putting together a haunt is exactly the types of activity I’d love to fill a season with. I brought my eldest with me, and on the way we stopped at Burger King because we’d heard that they were offering Scary Black Cherry frozen Fanta that turned your mouth black when you drank it. My BK didn’t have them, unfortunately, but they did have cardboard Halloween crowns that looked like they were cut out of the skin of Frankenstein’s monster. So it was a worthwhile stop. At the school, it looked the place had the makings for a pretty grand harvest party, judging by all the decorations strung up in the hallways and gymnasium. Nothing like I ever went to as a kid, that’s for sure. In the haunted hallway, I listed to my friend’s vision for it, which was way bigger than could fit in any elementary school hallway, and then helped him start putting it together. It is amazing what can be built using twigs, tarps, lights, and polyester beef netting (apparently it’s great for both wrapping meat and covering things in spider webs). I was there for about four and a half hours, helping to lug around Pumpkinrot-inspired scarecrows and cutting and stringing beef netting for the Spider Tunnel. When I left, there was still a lot of work to do, but the custodian was about to kick everybody out, so the rest of the work would have to be completed in the morning. My friend gave me permission to post some photos of the completed haunt here on OTIS after it’s done, so look out for those at some point soon. I think the kids are going to dig this thing a lot. They won’t look at this hallway the same again. And they’re definitely going to be too scared. And that’s great.